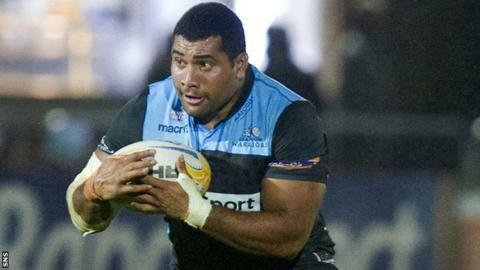 Fiji international prop Jerry Yanuyanutawa has signed a new one-year contract with Glasgow Warriors. The 29-year-old has made 16 appearances since joining from London Irish last summer. "I've enjoyed my first season in Glasgow and I'm really happy to be staying at the club," he said. And head coach Gregor Townsend added: "He has worked hard on improving his game and always gives 100 per cent when wearing the Warriors jersey." Glasgow have already secured a Pro12 play-off place but will be assured of a home semi-final tie if they beat Zebre on Saturday. "It's a really exciting time to be at the club," said Yanuyanutawa. "We have a really strong squad and there is a lot of competition for places, which means you have to perform every time you're given the opportunity. Townsend praised the "really positive contribution" of the prop this term. "It's great news that he's staying at the club and he will provide us with competition in our front row next season," explained the head coach.